State Sen. Sen. Andy Sanborn, R-Henniker, left, during debate with Sen. Ray White, R-Bedford, on the Senate floor in the Statehouse Wednesday, May 2, 2012 in Concord, N.H. 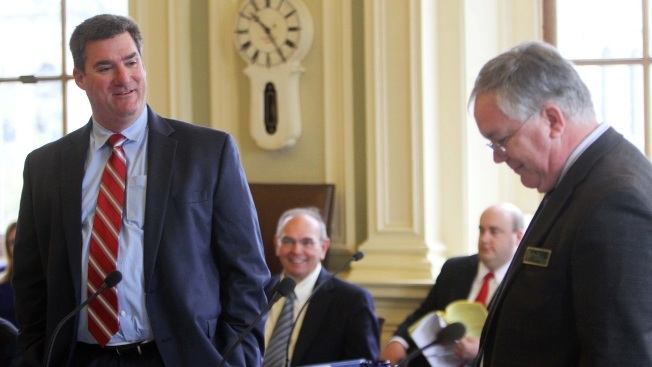 The attorney general's office says there's no credible evidence that a New Hampshire Senate intern was paid off in exchange for keeping quiet about an inappropriate comment a senator made to him in 2013. Sen. Andy Sanborn, a Bedford Republican who is running for Congress, has acknowledged using what he called "crass language." The Senate president later asked the attorney general to investigate whether the intern was given a job in the Senate clerk's office and cash from the former Senate chief of staff in exchange for his silence. Senior Assistant Attorney General Geoffrey Ward said Tuesday the investigation, which included 18 interviews, found no connection between Sanborn's comment, the job and the money, which the chief of staff said was a personal loan that was quickly paid back.